my kids have the same birthday, three years apart. yep, that's right. they are roughly three years and four hours apart. and no, it wasn't planned. 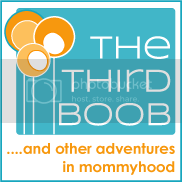 i've always had a crafty side - scrapbooking, graphic design, heck I even made soap for a time - but with two kids, running my consulting business, keeping up with two blogs and just life in general, my craftiness somehow got stored on the shelf for a while. but then birthdays roll around. and I get that itch to CREATE something. i want my kids to have a birthday from "pages" of pinterest in all its crafty goodness. i've done it before. last year, i went all out throwing both of my kids a party in the same day. one for little roo turning one and then more people came and we continued the celebration for big roo turning four. um, that was nuts. this year? i just didn't have it in me to get all crafty. but yet that mama guilt creeped in like mama guilt does and i worried when their birthday rolled around, they'd be disappointed. it's not like i didn't have anything planned. we had balloons and a gift each to greet them in the morning. we made rice krispy treats for their classes at school. we ate at mcdonalds for lunch (which we never do!). we went to chuck e cheese for dinner (another thing we never do!). and we even had a little cake for them at home after dinner. a totally exhausting day without one picture-perfect craft in sight. 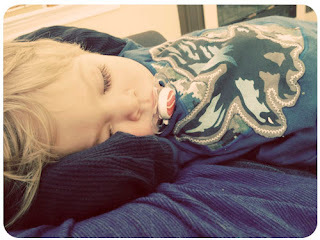 little roo was so exhausted he fell asleep right on my chest (that's after the nap in his crib, by the way). snuggling with my baby boy on his special day. and it hit me. why should I feel guilty that I didn't break out glue, paper and ribbon to make some snazzy decor or spend all day slaving over a creatively cute meal? after all, they don't care that their meal didn't come from my pinterest food board or that I didn't stay up all night making something for them. i treated them like birthday boys in the simplest way possible: i showed them they were loved. and there wasn't a glue stick in sight. 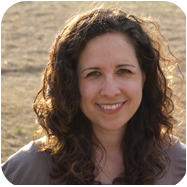 melissa culbertson is a mom, marketing communications consultant, blogger, author of the diy blog critique and creator of the upcoming content brew, an online blogging course about content planning and idea creation. you can find her on twitter and at hanging out at her blogs momcomm and adventuroo. And showing your kids they are loved is all that matters. Every year, I work to create the perfect theme for my kids' birthdays. But they don't care! They just want to run around with their friends and get gifts. I'm glad you're giving yourself a break and not wearing guilt because of this! It's so true! They really just want the cake! And this is why I don't follow party boards on pinterest LOL!! I always feel like my parties are not as awesome. I will tell you this though: as long as your kids are not pinning pictures of awesome parties on Pinterest, your parties are always their favorite!! Yeah I'm keeping my kids away from the Pinterest. No need to see what other mommies do! I get so frustrated and exhausted after birthday parties every year, and think to myself... why didnt the four of us just go somewhere special that the kids like? I LOVE this post! Need to bookmark it and remind myself of it before my DD's next birthday rolls around. Thanks Shannon! It was nice to be more chill about parties this year! I didn't realize your boys were born on the same day, very cool, my mom and her sister are exactly 10 years apart. I hear you on the crafty front, if I had time I would be awesome, but alas, life sets in. My girls birthdays are 3 years 1.5 months apart and that's enough for me. I start planning early, and we have pretty good sized parties, just something I loved from my childhood that I want to pass on to my girls. I think no matter how you celebrate it's best to go with your mention, show them they are loved!!! Fun post! Thanks girl! I planned so early last year. This year it was by the seat of my pants! Yeah we didn't even have friends over for Oscar. Some of our extended family was here so we did a few cupcakes and character plates. And he loved every minute. It sounds like your boys did too! Exactly! The simple things work. Haha! I think it's perfect that you pinned it! Such a refreshing post on the birthday bit. With pinterest guilt and all, it feels like we're keeping up with the Jones online too. Here is to authentic and un-crafted goodness! Thanks ladies for having me guest post! It was lots of fun!